This old-fashioned cottage pudding makes a great everyday dessert or snack. Cottage pudding is a cake which is served with a glaze or custard sauce. 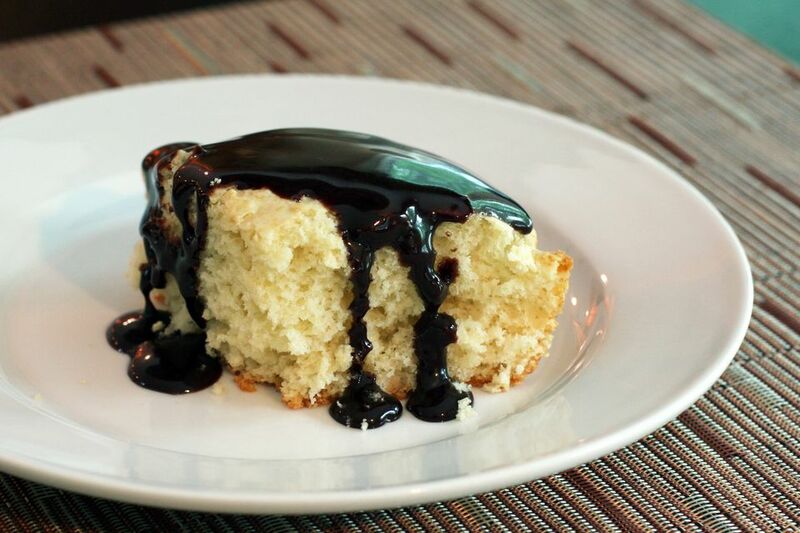 Serve this cake with the included chocolate sauce or use your favorite warm dessert sauce. Grease and flour an 8 or 9-inch square baking pan. In a mixing bowl with electric mixer, cream butter and sugar until light and fluffy, about 4 to 5 minutes. Beat the egg into the creamed mixture until blended. Measure the milk into a measuring cup. Stir the 1 teaspoon of vanilla into the milk. In another bowl, combine the flour and baking powder. Bake in the preheated oven for about 30 minutes, until firm and a toothpick — inserted into the center of the cake — comes out with only a few crumbs clinging. In a saucepan of stainless steel bowl over simmering water, heat the semisweet chocolate chips with the whipping cream, stirring constantly until the chocolate is melted. Stir in 1 teaspoon of vanilla extract. Drizzle the chocolate sauce over the cooled cake.